www.acumatica.com Blog What is the ERP Implementation Process? At Acumatica, we recognize that selecting the right ERP system software for your organization is an important decision that takes time and research. But, once selected, implementing that software can be intimidating. An ERP implementation involves installing the software, moving your financial data over to the new system, configuring your users and processes, and training your users on the software. Choosing the right partner for implementing your ERP system is almost as important as selecting the right software in the first place. As with any large project, it’s imperative that you to take things one step at a time. Thankfully, successful and calm ERP implementations are not only feasible, but actually quite common. Before we look at the implementation process in detail, your initial focus should be on selecting the right ERP system software provider for your business. The expected results of implementing the correct ERP technology should be streamlined operations, easy-to-use functionality, a real-time view of your business anytime and anywhere on any device, and an ERP platform that is not only secure but adaptable to the ever-changing needs of your company. This is something we know a bit about at Acumatica. Once you have selected your ERP solution, the next step is implementing the ERP system software. What type of implementation project is it? Express – Implementation is functional out-of-the-box (OOB); the customer is a single entity without complex processes and no add-on solutions are required. Standard – Implementation is for Single or Multiple entities that require minimal customizations and add-on solutions, and are single currency and language. Advanced – Implementation is for Single or Multiple entities with various locations, multiple currencies, and languages. Their business processes and integrations range from moderate to complex. A complex roll-out is involved with multiple phases (Template or Pilot roll-out). With Acumatica, your Partner will be responsible for recognizing what project type your ERP implementation is and will then use the methodology and tools we have established in our newly released Acumatica Solution Framework. It is designed to guide our Partner organizations through the various project types and emphasize that not every project should be treated the same due to their dynamic nature. ERP implementations should concentrate on Project Management as the key to success. In the Acumatica Solution Delivery Framework, I define Project Management as “application of knowledge, skills, tools, and techniques to manage activities to meet the project objectives. Project management is all about comparing the progress made against the original plan and thereby updating the plan.” To accomplish this, assembling a Project Management Team to guide the project from beginning to end is necessary. Deciding to upgrade your existing ERP system software or implement a new ERP system is a major undertaking. As such, the team you put together should consist of people throughout the organization that will be the most affected by the ERP technology – the users. A smooth transition from an old system to a new one is never guaranteed, but the people who will gain the most from it are motivated by anticipating the results they will achieve and getting the benefits of those results as quickly as possible. It’s also important to note that communicating exactly what is happening, why it’s happening, and when it’s happening throughout the process will keep everyone in the loop and mitigate the anxiety ERP implementations can engender. Surprises can be both good and bad. 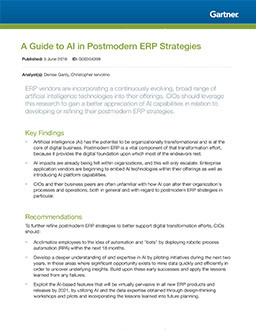 If your employees – the end users – understand from the beginning that adopting ERP technology is a business initiative and strategy and not just a new software package or an IT project, then they are more likely to support the entire process. The Project Management Team includes an Executive Sponsor who oversees the project in a part-time capacity. He or she provides the expectations for the project along with the needed resources; he or she is available to help answer the inevitable questions or alleviate any concerns that arise. The team also requires a Project Leader who is knowledgeable about your business, has previous management experience, and can communicate clearly. The leader represents the team and the project to upper management and is responsible for achieving the project objectives. The remaining Team Members will be assigned their detailed tasks and responsibilities during the planning process; the team members should be chosen based on their level of expertise and knowledge relating to the task, as they will be the most affected and the most willing to see the ERP system software implementation succeed. Discovery – Consists of processes that help define the need, vision, scope of the project, and obtain commitment from the customer to continue. Plan & Monitor – Consists of processes that involve developing a strategy to complete the work, as well as measure the progress and take corrective action as required. This occurs throughout the entire process. Analyze – This stage is a more detailed level of discovery and consists of processes that involve gathering detailed requirements and analyzing the client’s business needs. Build – Involve processes that carry out the tasks identified in the strategy. Stabilize – Consists of a set of processes to ensure a solution meets the client’s requirements and is ready for full deployment to a live production environment. This also includes a client’s readiness to use the solution. Deploy – Processes that will deploy the solution to a production environment. Post Go Live – Processes that are in place to support the client once they are live on the solution, which lead to project closure. What Is an ERP Implementation Life Cycle? The ERP implementation life cycle isn’t as complex as it seems. Just make sure to prepare for these eight stages, and you can’t lose. Acumatica customer, PayWith, chose Acumatica’s ERP system software over SAP; they desired a cloud-based platform that would scale with their as-yet undetermined business model. Being agile and cost-effective were also factors in their choice. Once they made the decision, their implementation took only five months. The company – which creates and manages mobile loyalty, rewards, and marketing programs for brick and mortar organizations – must settle thousands of daily transactions efficiently and accurately. Utilizing Acumatica’s Financial Management Suite and Inter-Company Accounting Module, PayWith has grown 50% year over year since their implementation. The business’ smooth start and continuing growth is a great example of correctly following Acumatica’s stages of ERP implementations. Find their complete customer success story here. Your Acumatica Partner – who has trained on and passed an Acumatica exam regarding ERP implementations – will be with you every step of the way. Whether you have an Express, Standard, or Advanced project type, you will have the tools, resources, and methodology needed to implement your ERP system software successfully. The stages of implementing ERP technology ensure that your Partner and your Project Management Team – all of whom desire functionality, usability, and flexibility for the end users – expertly handle the implementation process. I hope this gave you an overall picture of what the ERP implementation process looks like and how peaceful it can be when done correctly. All ERP implementations vary in scope and ERP technology is constantly changing but we know how to handle these changes with ease. Contact us and we’ll start the rewarding process of implementing your ERP system software today. Senior Implementation Consultant at Acumatica. With over 20 years of experience supporting and implementing business solutions for the SMB market, Valerie's professional experience includes roles in product marketing, product management, project management, and professional services. She has worked with several business solutions spanning the Microsoft Dynamics, SAP and Demandware channels, and has extensive experience implementing and supporting Customer Relationship Management and eCommerce solutions.